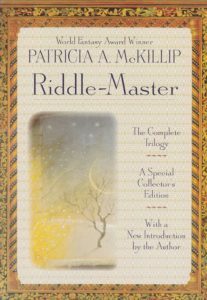 There are two reprints of the collected Riddle-Master trilogy – one in 1979, and another in 1999. The land-rule of Hed passed to Morgon prematurely, when his parents died at sea. He became one with his rural homeland, his heart and senses bound to its every living creature. And if he hadn’t loved harping and riddlery, he might have remained a farmer all his life. The Riddle-Master of Hed. At the College at Caithnard, men studied the riddles left behind by wizards who’d vanished long ago, hoping to unravel the secrets of the past. Morgon found the complex lore fascinating, and grew so adept at riddlery that he became Caithnard’s youngest master. Then, scarcely knowing why, he staked his life on a bizarre riddle-game – and won. The prize was the hand of beautiful Raederle of An. But before Morgon could marry her, he met the High One’s harpist – a man whose music and mystery drew him inexplicably. 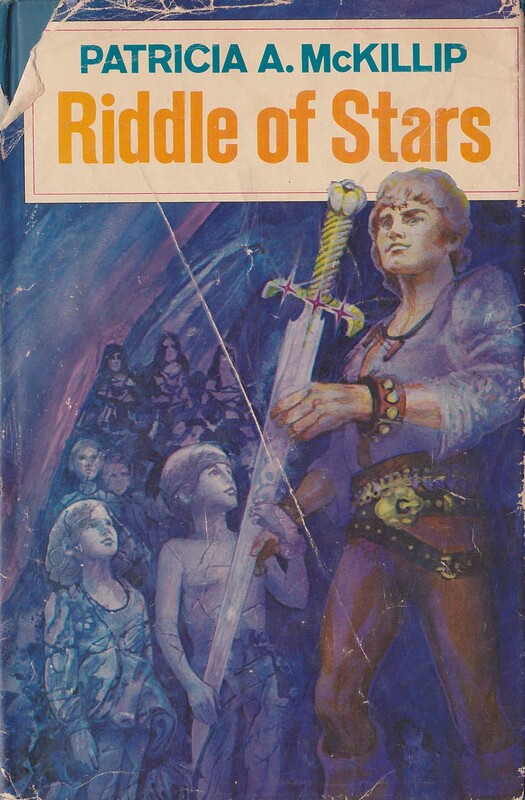 And because of that encounter, Morgon was forced to confront the most puzzling riddle of all: the harp and the sword with stars that matched those on his face. Heir of Sea and Fire. Morgon had disappeared; some said he was dead, although no one knew for sure, and Raederle felt that she’d waited long enough. It seemed that the only way to learn his fate was to travel to Erlenstar Mountain and ask the High One himself. The journey was perilous in the best of times, and right now – with part of the realm fighting a war against a cruel, nameless foe – the danger was greatly increased. But Raederle was a woman of courage and purpose…and, apart from Morgon’s death, the only thing she feared was the unexpected stirring of power within herself. Harpist in the Wind. The peace of centuries had been shattered. Land-rulers prepared for war, knowing that their enemy fought in ways no human could match. It was as if the ancient battles which had once nearly destroyed the realm were about to be reenacted. And the only hope of averting disaster lay with Morgon of Hed – who had been born to power he did not want…and who feared his destiny even as he turned to meet it, because he knew it might very well bring about the end of his world. I don’t know if Ms. McKillip is so interested but I believe this series is due consideration by Hollywood. When you think of this series it has many elements of recent successful movies… the mystery and search for answers similar to the DaVinci Code, the supernatural enemy of Pirates of the Caribbean, and the magical presence of Lord of the Rings. While the series is gripping in and of itself, a bit of license in creating a grimmer feel to the story would translate well to film. But it would require a director with integrity and a willingness to stay true to the book in the way of Peter Jackson with LOTR. It was this series that started my adventure and reading and I believe the story and I’d love to see a live action version do it justice. This series is one of the greatest fantasies ever written… in my opinion, of course 🙂 I loved it at first read, and it has never lost its appeal. The Forgotten Beasts of Eld is next up right behind the Riddle-Master series, too. There was even a song that I once heard, “Shapeshifter,” that is based on the Riddle-Master series. I fell in love with the song, and years later found out that I had unknowingly married the songwriter! We both shared the love of this series, and have several copies, so that we can lend and never risk losing our originals. 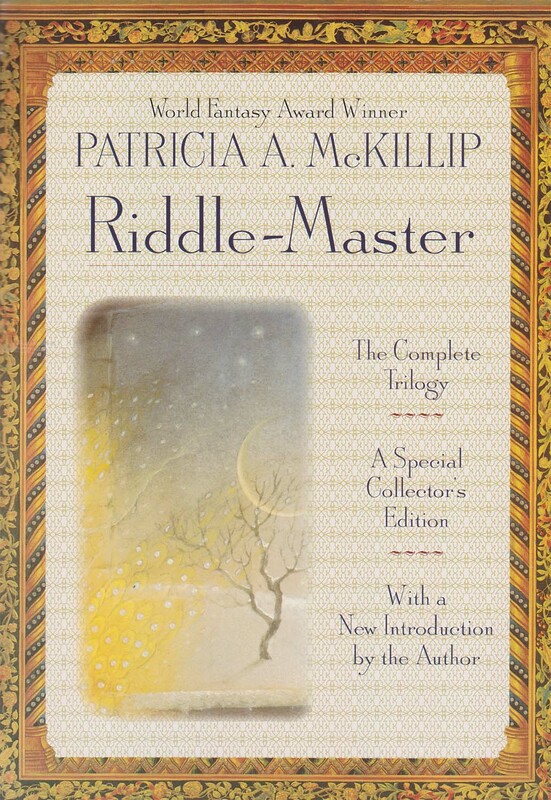 Patricia McKillip is probably the one writer of all that I would most love to meet! I first read this trilogy to my daughter almost 25 years ago, and am now re-reading it before giving it to my 10 year old grand-daughter for Christmas. it is a marvelous, magical trilogy. We loved it then, and I love it still. My grand-daughter is a great reader and really likes fantasy books. I can’t wait to introduce her to it now she is old enough. 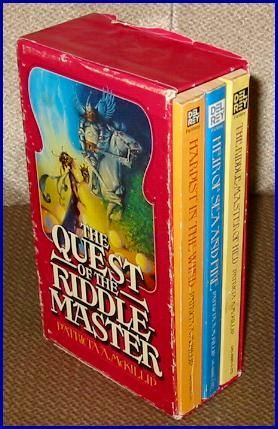 I have pretty clear memories of discovering this trilogy. I still remember reading the first book, getting to the end, and just about going crazy over the cliffhanger. I was about 12, and didn’t understand just how many cliffhanger endings I’d be dealing with in my book reading life. The rest of the series lived up to the promise (although I’m talking original release time; I had to wait for each book to come out). It has remained one of my all-time favorite series since then, changing along with me as I read it over the years. I’ve seen and understood different things in each re-read, and I’m as amazed by the story now as I was then. Thank you, Ms. McKillip, for writing it, and thank you for not writing a sequel series. It’s absolutely perfect as it is. 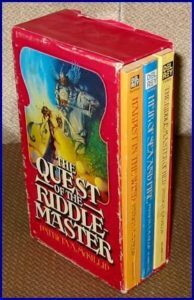 I first read The Riddle Master of Hed when I was in fifth grade. My library had only The Riddle Master of Hed and The Heir of Sea and Fire, and I had no idea there was a third book until I stumbled across Harpist in the Wind at my local used book store two years later. I remember the moment I found it on the shelf, staring in wonder and joy that the story continued. Since then, it has been my favorite collection of stories. I have read them at least once a year, and often more, and most recently the German translation. They are my travel companions, and the first books I recommend to others.